Kisame Hoshigaki (干柿鬼鮫 Hoshigaki Kisame?) 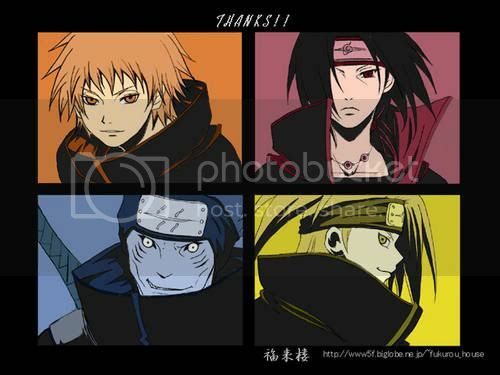 is a missing-nin from Kirigakure and is partnered with Itachi Uchiha. Their first appearance was shortly after the attack on Konoha by Orochimaru, where they attempted to kidnap Naruto Uzumaki. They were thwarted by Jiraiya. Itachi later explained that it wasn't the proper time to kidnap Naruto yet, and that Naruto could be captured at any time given his skill level at the time. 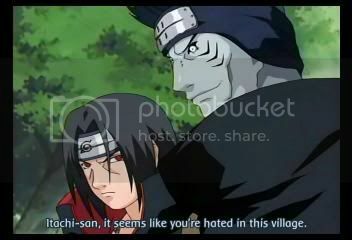 Unlike most other two-man teams of Akatsuki, Kisame gets along well with his partner. 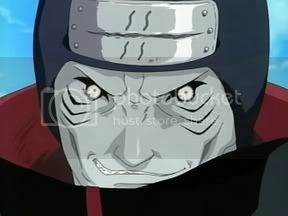 Kisame has a distinctive shark-like appearance, complete with pale blue skin, small white eyes, gill-like facial structures, and sharp triangular teeth. Even his name, Kisame (鬼鮫), means "Demon Shark". Despite his rather brutish appearance and his apparent love for battle, Kisame speaks in a calm and polite manner compared to most of the other members of Akatsuki. Kisame is also one of the Seven Swordsmen of the Mist (霧の忍刀七人衆 Kiri no Shinobigatana Shichinin Shū?) and is known as the Mysterious Person (Monster) of the Hidden Mist (霧隠れの怪人 Kirigakure no Kaijin?). Zabuza Momochi and Raiga Kurosuki were also members. Like the other two members, he is somewhat overconfident in battle. He also clearly enjoys fighting and possibly mutilating his opponents; for example, he entertains the idea of removing Naruto's legs to keep him from running instead of the much simpler method of knocking Naruto unconscious. During his battle with Asuma Sarutobi, Kisame also took great pleasure in shredding his shoulder with Samehada. 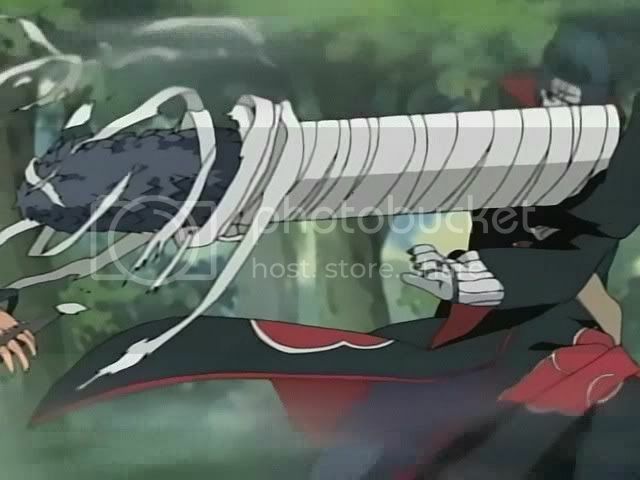 Kisame's main weapon is Samehada (鮫肌, "Shark skin"), a large unique sword of comparable size to Zabuza Momochi's zanbatō. Unlike a regular sword, Samehada is covered in large scales that shave instead of cut, much like a shark's skin (hence the name). It also has the ability to absorb any chakra around it, allowing Kisame to literally cut through his opponent's chakra. The amount that it can absorb is unclear, but it can even consume the demon fox's chakra with no ill effects. Samehada is also a sentient weapon and only allows Kisame to wield it. When Might Guy attempted to hold Samehada and use it against Kisame, it responded with a flurry of spikes from its handle and found its way back to Kisame. 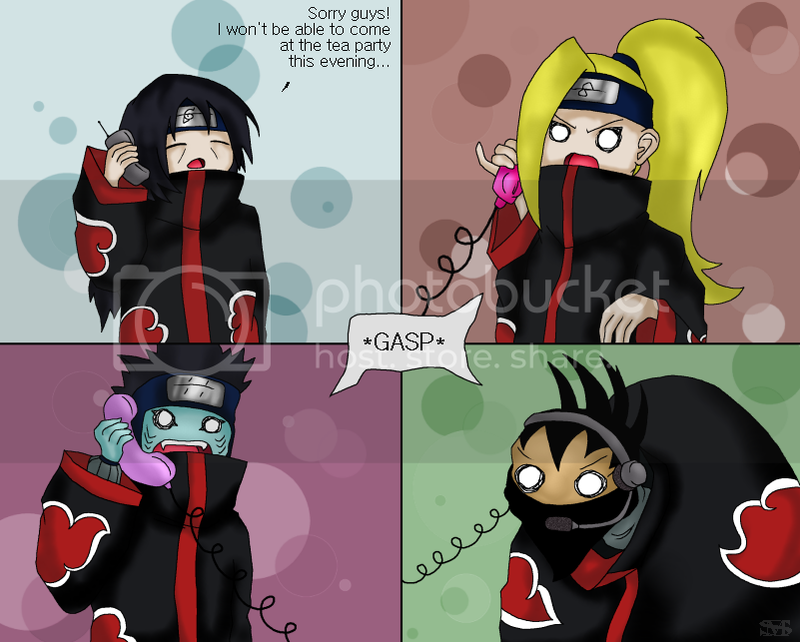 The amount of chakra Kisame possesses is apparently very large, even by Akatsuki's standards. 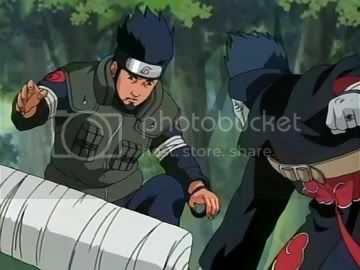 Their leader commented on this; a Kisame body-double at thirty-percent power – made with the leader's Shapeshifting Technique – had as much chakra as Naruto while drawing on demon fox's chakra when he fought Neji during the Chunin exams, an observation made by Neji Hyuga when he observed Kisame's body-double with his Byakugan. Kisame has displayed astonishing speed and incredible physical strength. Like everyone seen from Kirigakure, Kisame uses water-based jutsu in combination with his powerful physical attacks. He has also demonstrated the ability to create water from nothing, allowing him to turn any potential battleground into a lake for his other water-based attacks. Login or register to add +Kisame Hoshigaki+ as your friend!